Annemieke Harmonie (Bachelor of Education, Dip of Teaching, Dip of Shiatsu) was born and raised in Holland. She has learnt the harp since she was nine. From a young age she was asked to perform for people in rest homes, Irish pubs, churches, in restaurants, schools etc. She attended Irish Summer schools to find out more about the Irish harp. She visited many different cultures and was inspired by their customs and arts and music. She performed worldwide in castles, palaces, monasteries, museums, at wineries, on beach weddings, at funerals, in churches, at festivals, for prime ministers, and recently for the governor general of NZ. Annemieke started a harp school in Auckland in 1995, and they traveled with 15 harpists to Great Barrier Island and Waiheke Island for local performances. Quite an ordeal with all those harps on the boat...but what a divine surprise for the local residents! 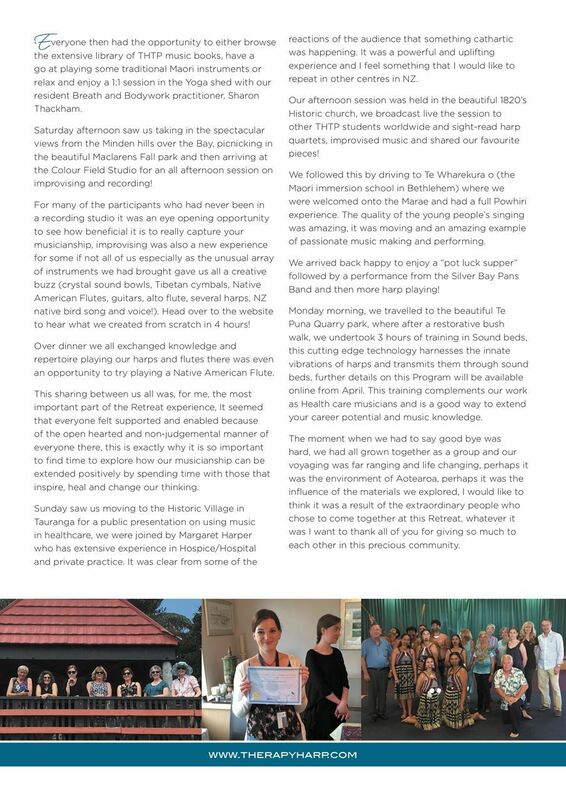 They also performed in the pumphouse in Takapuna and in Titirangi hall. Annemieke met Sue Johnson and together they made a CD with original songs, featuring voice, harp and guitar. They entertained their music in restaurants, at parties and at weddings. Annemieke gained her Zen Shiatsu diploma. In 1999 she moved to Dunedin, and during the next twelve years she had three children and ran the Dunedin harp school and orchestra. Again there were many people interested in learning the harp, and many performances were done for the public. In Dunedin Annemieke created her three meditation CD's with Janine Joyce, and also her CD with her own harp compositions. In 2010 Annemieke and her three children moved to Nelson, after traveling through New Zealand to find a good place to live and a bit warmer than Dunedin...they enjoy growing their own organic food. Her two daughters Aster and Lisa are also accomplished harpists. There is now a thriving harp community in Nelson and she is teaching thirty students. The Nelson harp orchestra runs biannually and will start again in April 2019. It is open to harpists of all levels. We practice every second Monday of the month. They will perform for the public on Sat 26th Oct 2019 at 3 pm in the Richmond Town Hall and on Sat 2 Nov 2019 at 3 pm the NCMA in Nelson. Annemieke has studied improv theatre and regularly plays improv harp with the Nelson theatre. It is fun to create sounds to add to the unpredictable, often hilariously funny story line! She continues to play for weddings and all other occasions when she can. Annemieke combines improvised harp music with words to form deeper inner journeys called harp meditations. She also facilitates retreats. The monthly harp meditations will start up again on the last Thursday of the month from the 28th of February 2019. These meditations last an hour and are held every last Thursday of the month. Bring a blanket/ mat if you want to lie down. Just turn up, no bookings required. A journey of light, remembering and insight, embracing the parts of us that need us most. The sounds of the harp interwoven with words and intention will take you on journeys within yourself, where you can safely explore. These harp journeys have lasting positive effects. During the retreat there will be a mixture of harp meditations, intuition enhancing exercises (they are playful, fun and encourage your intuition to speak), reflection time, creativity (you are invited to make your own wall hanging to take home with your journey reflected on it), sharing from our heart. Cost; $295 for the weekend or $40 for the Friday evening harp meditation only. Accommodation and food not included. Venue; Barnett Hall, 2 North Piha Road. During the retreat there will be harp meditations (in a warm room with a fireplace), intuition enhancing exercises (they are playful, fun and encourage your intuition to speak), reflection time, creativity (you are invited to make your own wall hanging to take home with your journey reflected on it), sharing from our heart. Accommodation and superb food is included. Venue; Wangapeka retreat center, 355 Wangapeka River road. This deeply transformative retreat is now travelling too. If you want to host this in your area please email Annemieke. Annemieke started her studies in ConTact C.A.R.E in 2018 and she is currently a student practitioner. Her book 'From My Life to Yours' was published in November 2018. This book presents her story, one filled with initiations, challenges, adversity and magic. From an early age, Annemieke tried to make sense of this world and to find out who she is and why others can't see what she does. Her connection with the natural world became her guide. A musician from the age of nine, she traveled through the world with her harp and visited a wide variety of places. She finally settled far from her homeland, in New Zealand, where she raised and home schooled her three children on her own. Through both music and various healing modalities, Annemieke found ways to reach out to others and make this world a better place for all. In this memoir, one woman shares her life story, describing a challenging life worth living that calls forth love and inspiration in those around her. Annemieke is dreaming up and implementing new realities, where happiness, love, health, beauty and peace exist for everyone, every day. Where people believe in their dreams again and have the courage to be different. or you can order the book online as an e-book world wide . 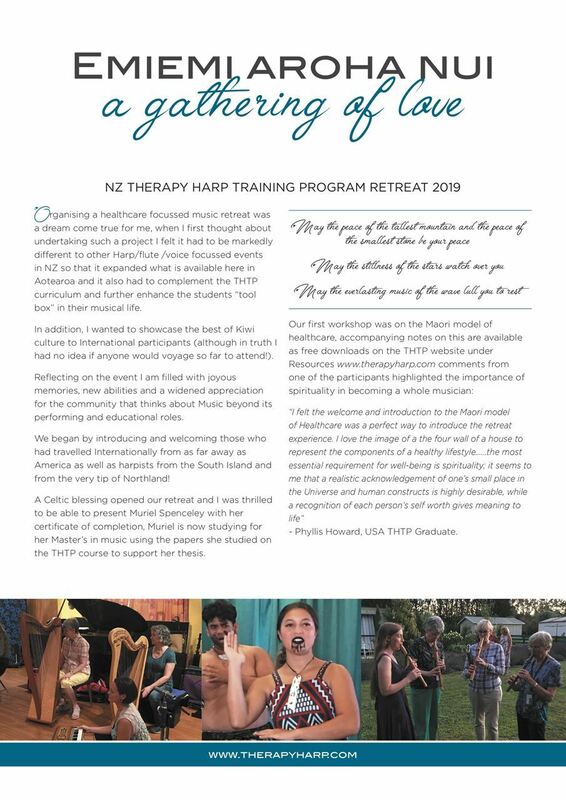 The Harp Society is planning to sponsor Natalia Mann touring Aotearoa with a full day improvisation workshop and/or performance during the month of April 2019. Our hope is to include some of the regional areas in addition to the main centres - specific locations will be determined by registered interest see link to the survey registering interest below. Natalia is known for her creative and contemporary style of harp playing. She works internationally as performer, composer, collaborator and artist. Her workshops have been very popular with those harpists who have attended in the past. Natalia's Website is: http://www.nataliamann.com/ and facebook page is: https://www.facebook.com/NataliaMannArts for those who wish to learn a bit more about Natalia. I am excited to present my "Art is Life" Improvisation Workshop Tour and I would like to know where to go. I can come to almost any town in the country if there’s enough interest. Can you help me plan my route by registering your interest? Would you like to feel freedom on your instrument? Would you like to be able to play music without having to practice every note? Then shake out your inhibitions, have fun creating spontaneous music - this workshop is for you. It doesn’t matter what instrument, doesn’t matter about your expertise. “Art Is Life” and there’s room for everyone. Just come with an open mind, ready to experiment, explore and … play! Harp Society Members (past, present, or future) could you help us? Looking to see if there is interest in a regular North of Auckland Harp Circle. First one Sun Sept 9, 2018 in Snells Beach. Email Becky for details. Current plan is it will be a mix of playing some ensemble music, and encouraging people who attend to play a piece they've been working on for a friendly bunch of people (not required, just encouraged), and a bit of socializing. Contact Becky if you are interested in joining in, even if you can't make the first one. With winter well underway, what a better time for an introduction of a new book of groovy music for the intermediate to advanced harpist. The five pieces contained in this work have a wide range of titles that evoke images and thoughts of springtime, dancing and holidays in tropical places. All five pieces are specifically written for lever harp, but are possible on pedal harp too with only a few easy pedal changes. The book or pdf download (available in both formats) includes 5 pieces at approximately grade 5 and up level, although the focus of these pieces is on creating and capturing the character of the music rather than on technical elements. The pieces vary in length from 2 to 7 pages, syncopation and percussion is a focus in most of the pieces. Lever markings are given at the beginning of each piece, with no lever changes during the piece, so one can focus on the rhythmic and percussive elements of the music. This is a definite advantage for lever harp players! Guidance is provided as to the rhythms and how to bring out the various elements of the piece; as well as some background on each piece to help inspire your own performance of the music. One of the reasons I particularly like this book is I think players and listeners alike will really engage with it, a sense of fun and adventure that will put smiles on performers and listeners alike. It’s always good for a gigging harpist to have a few pieces of this nature to pull out and recapture an audience’s attention. I have enjoyed these pieces for many reasons, but mostly for their very catchy tunes with lots of groove and their so very well placed extended techniques! Each piece is musically satisfying and fun to play. They are programmatic and will be very accessible to an audience of non-musicians and musicians alike. This year we’d like NZHS members to send in your photo of you out busking. In the photo we’d like to be able to see where you are (outside a shop or in a market) and the date (most phones/cameras can do this), and we’ll put you in the draw for a gift voucher from The Harp Column (www.harpcolumn.com) to be announced in December. You can go busking as a soloist or part of a group! Please send your photos in advance of the journal deadlines – 20 June and 20 October 2018 and all photos will be published in subsequent journals. NZ Harp Performance Competition!!! closes 27 July.